Today, Saturday 19 July, is the last day to catch Ajay Sharma’s exhibition The Speed of Life. Why not come along and join us between 3.00 – 5.00pm to say farewell to Ajay and to take the opportunity to talk to him about his work. The process employed to create a miniature painting is incredible and the symbolism and narratives in the imagery are fascinating. 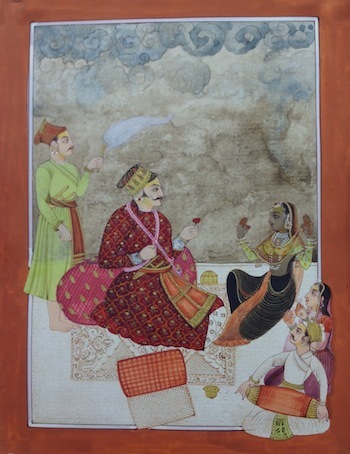 Ajay Sharma, Maharraja Dhiraj Singh, 2013. Natural pigments on paper. 21 x 16cm. Photo credit: AirSpace Projects.